Sesame is a flowering plant in the genus Sesamum. Sesame seed is one of the oldest oilseed crops known. The nutty flavor makes this seed a very popular oil to cook with in many cuisines. Sesame is a flowering plant in the genus Sesamum. Sesame seed is one of the oldest oilseed crops known. The nutty flavor makes this seed a very popular oil to cook within many cuisines. Here are the top 7 health benefits of sesame. 1. Sesame is an excellent source of protein. For every ounce, sesame seeds have 4.7 grams of protein, making this plant a great source vegetarian protein. 2. Sesame may help prevent type 2 diabetes. A study from the Vinayaka Missions University concluded that sesame seeds could help individuals with high blood sugar levels. Also, sesame oil can help prevent type 2 diabetes. 3. Sesame may reduce blood pressure. A study from Karolinska Institutet suggested that sesame oil can lower blood pressure in hypertensive diabetics. Sesame seeds also have a high amount of magnesium. Magnesium has been shown to help lower blood pressure. 4. Sesame may help strengthen your heart. Sesame seed oil may boost heart health by preventing atherosclerotic lesions. An antioxidant and anti-inflammatory compound known as sesamol may assist in preventing the artery from thickening. 5. Sesame may help protect against DNA damage from radiation. 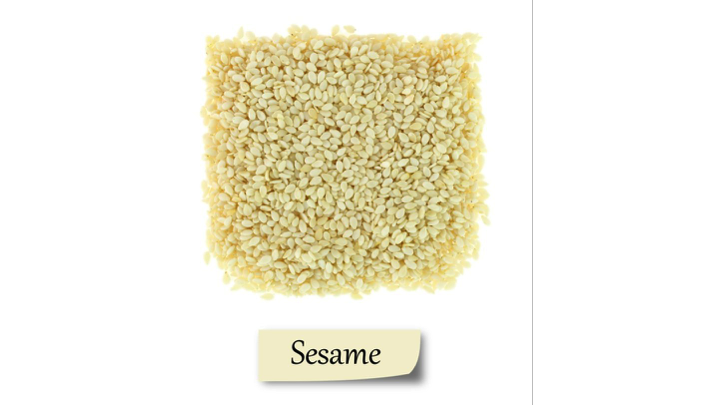 Sesamol, the constituent found in sesame seeds and sesame oil, has been shown in multiple studies to protect against DNA damaged caused by radiation. In a mouse model, sesamol extended mice’s lives that were treated with radiation. 6. Sesame may prevent various cancers. Sesame seeds contain an anti-cancer constituent called phytate. Also, the high amounts of magnesium found in sesame seeds could decrease the risk of colorectal tumors by 13 percent and the risk of colorectal cancer decreased by 12 percent for every 100 mg of magnesium taken in. 7. Sesame may boost bone durability. Sesame seeds contain an excellent source of zinc, which is found to increase bone mineral density and overall bone health. Sankar, D., Ali, A., Sambandam, G., & Rao, R. (2011). Sesame oil exhibits synergistic effect with anti-diabetic medication in patients with type 2 diabetes mellitus. Clinical nutrition, 30(3), 351-358. Hyun, T. H., Barrett-Connor, E., & Milne, D. B. (2004). Zinc intakes and plasma concentrations in men with osteoporosis: the Rancho Bernardo Study. The American journal of clinical nutrition, 80(3), 715-721. Kanimozhi, P., & Prasad, N. R. (2009). Antioxidant potential of sesamol and its role on radiation-induced DNA damage in whole-body irradiated Swiss albino mice. Environmental toxicology and pharmacology, 28(2), 192-197. Wark, P. A., Lau, R., Norat, T., & Kampman, E. (2012). Magnesium intake and colorectal tumor risk: a case-control study and meta-analysis. The American journal of clinical nutrition, 96(3), 622-631.